Trip date: 7.21.05 - 7.26.05. We never thought France would be so perfect. 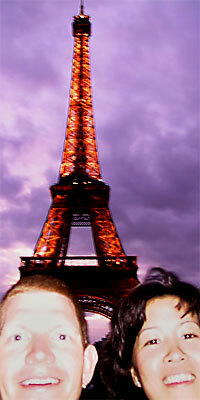 Our trip to Paris was probably the best time we've had in any city. We went for a long weekend, leaving on a Thursday and returning on a Tuesday, but it felt like we had been gone for much longer. We never thought we'd enjoy France as much as we did. Thank God we were proven wrong. Our mission was to see the last 2 days of the Tour de France. Being able to witness this huge event was truly outstanding, despite only seeing 2 days of it. Watching Lance Armstrong in his last Tour was somewhat bittersweet, but we were excited for his win and retirement, and the promise of a seeing new face next year. The city and the people of Paris were equally incredible. A pretty uncommon thing to hear, but it's true. The atmosphere of Paris was relaxed, and we really savored the slower pace. Maybe the beautiful summer weather helped Parisian attitudes because we were treated very well everywhere we went. But honestly, we think it was just a matter of us being considerate that led others to give the same thing back. Don't let the cynics scare you--everyone should experience France. WOULD WE GO BACK? Oui, absolument.